Quoting from the WSJ “Germany opposes the issuance of jointly backed European bonds, arguing that they would allow inefficient, highly indebted economies to gain a free ride on the stability and favorable financial conditions secured by the more-disciplined countries. 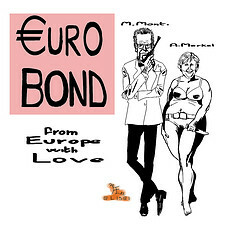 German officials have said that such bonds can be an option only once all euro-zone member states have improved the health of their finances and boosted their competitiveness.” To put the above in simple words we do not want to pay. Indeed this was expected as I recently got the opportunity to interact with a German Professor for Monetary Policy and International Economics Peter Bofinger, recently in one of the event held in Mumbai. He was one of the key person behind implementation of the euro. My first question to him on the possibility of Euro bonds. He argued that from the Germans prospective issuance of Eurobonds will be negative for them as he expressed that Germany is responsible for 27% of the obligations of EU and 20% of the liabilities of ECB. What I can figure out from the above argument is that what will happen to Bunds when they start backing Eurobonds? As the love for Bunds are the integral part of Germany. I thought of sharing an example to simplify, Issuing Eurobonds would be like the US issuing American bonds jointly with Argentina, Brazil, Peru, Colombia, Nicaragua, Honduras, Venezuela etc. To be more precise by summing up the above argument The road to Eurobonds will pass through the Budesbank setting conditions that can be just as easily fudged as the debt ratios required for joining the EU in the first place were. It is probably true that actual improvements will be required before hand, but they won’t be as onerous as they will sound. And they certainly won’t be forward-looking enough to prevent backsliding. I have just joined your blog…and I am really impressed with you financial markets knowledge…. Great stuff…keep it on. ! !